While it’s narrowly true that the European Union Agency for Fundamental Rights (FRA), the successor to the European Union Monitoring Centre for Racism and Xenophobia (EUMC), doesn’t include the Working Definition on their website (since their mandate differs from EUMC), a significant number of American and EU government and law enforcement agencies continue to use it to help determine whether incidents are antisemitic. Abunimah, who used to be a regular commentator at the Guardian on the Israeli-Palestinian Conflict, and continues to use his platform at Electronic Intifada to endorse terrorism and legitimize antisemitic extremism, is again in for a bit of bad news. A major report (Government Action on Antisemitism) by the UK Department of Communities and Local Governments, in response to the dangerous upsurge of antisemitism recorded in the UK over the summer, revealed that the professional body in the UK for policing now includes the definition in their Hate Crime Operational Guidance (2014). The [Hate Crime Operational Guidance] includes the European Monitoring Centre on Racism and Xenophobia definition in full and states that the ‘European Monitoring Centre on Racism and Xenophobia definition helps to explain some of the characteristics that may be present in antisemitic hate crime. These include circumstances that amount to hate crimes and those that are likely to be non-crime hate incidents’. 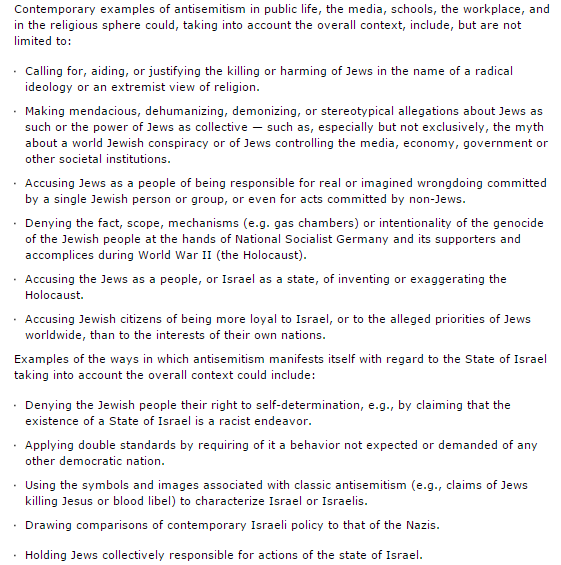 Though most manifestations of antisemitism included in the Working Definition shouldn’t even need to be pointed out (such as ‘justifying the killing or harming of Jews in the name of a radical ideology’), many who oppose it (such as Abunimah) seemingly do so because it defines as antisemitic the equating of Zionism with Nazism and defines as antisemitic calls for the end of the Jewish state. Despite the protests from a few marginal, extremist voices, the Working Definition continues to represent a widely respected tool for understanding modern antisemitism, and this blog will continue to use it in our fight against such manifestations of racism within the UK media. The World isn’t flat, it spins around the Sun, and Israel exists and will continue to do so in spite of his, and his loathsome kind’s, efforts and wishful thinking. ‘Noamy’ baby I would sooner ‘preach to the converted’ than ‘preach for the perverted’ as you and your ilk do. They’re the ones doing the perverting for the purpose of subverting – the dregs of dreck. Bad news, Ali Abomination. The World is a Zionist ploy simply because Israel’s exists. Maybe it’s time to change course, you blithering whackjob. No surprise. He hangs out with PLO members in the USA. You know who I see at when I look at Ali’s picture? I see the NEXT EDITOR IN CHIEF of the Manchester Guardian, folks. Clap your hands! This has to be the next Alan Rusbridger! Vision, charisma, ethics, no biases whatsoever. The whole package. First there is the Working Definition of Anti-Semitism, then there is Ali Abuminah’s tweet. Ali Abuminah is an anti-Semite. Yes, it’s really that simple. No need for a panel discussion nor any need to be shy about calling a thing what it is. I think we should have a weekend long workshop about the matter. As much as I dislike Ali Abunimah I don’t see much evidence of anti-semitism. He’s made a few anti-semitic remarks, but nothing that indicates to me that he has an anti-semitic worldview.